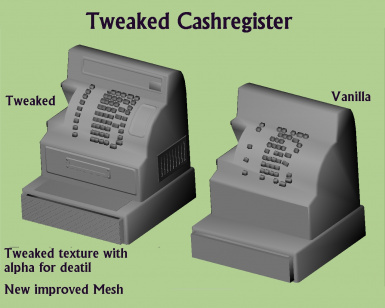 Cashregister tweaked and made more 3d based upon Tapioks cashregister retex. 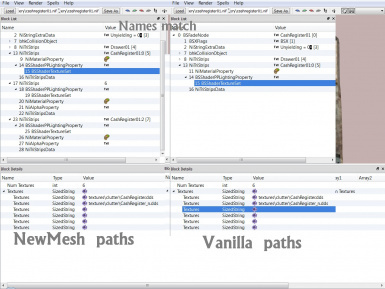 nif can be used in your mods but would be polite to tell me where it ends up, you will get a download out of it as well. The textures belong to Tapiok's Ojo Bueno HQ Saloon Hardware Pack V2 and you will have to as him for permission to use them. 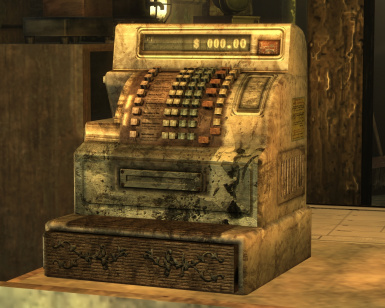 Add buttons, 2 grills, number dial and glass and ridges on drawer top and front.Tapioks cashregister retex has been tweaked to have alpha around the drawer scrollwork, due to how my mesh works. No compatiblity issues so far. No known issues so far, please let me know if you find any. 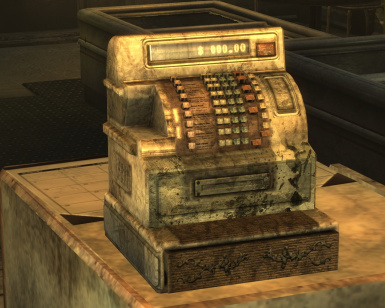 Thanks to Bethesda/obsidan for creating Fallout NV. Thanks to Tapiok for the retex that gave me the idea to make this. Use for your mods, but send me a download link to your mod if its released or post in commments. So I can see what you did.